Ok, I know, I know… I am late to the table with this one. But hey – better late than never. Have been busy at work this week – very busy so I haven’t had time to post anything. Windows 7 RC available on TechNet, MSDN and Connect! Well, you have to hand it to Microsoft – they stick to their plans… Although the bits have been available through torrents for a week already, they just released them on TechNet and Connect (and I assume MSDN as well). 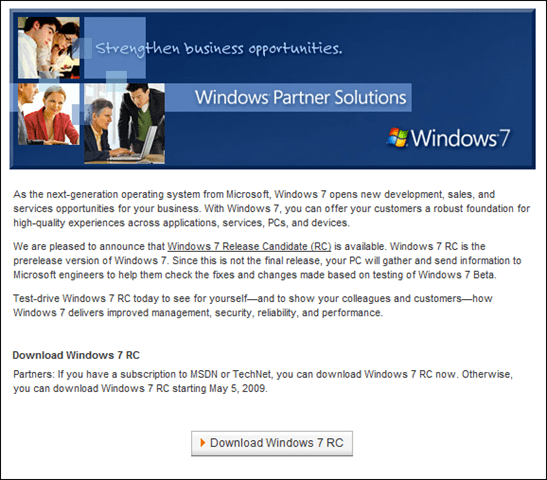 Microsoft published this page today clearly stating that Windows 7 RC will be publicly available starting May 5, 2009. As a TechNet member I have gone to my downloads page, but alas, it is not yet available. Will update this post as soon as it goes live there.